Keefer Ranch is located near the headwaters of Green Valley Creek in Sebastopol, with gently sloping, well-drained, south-facing exposure. Marcy Keefer, a nurse, and her husband Robert Keefer, a doctor who is now deceased, purchased the property in 1985. The vineyard was planted in 1988 on the site of a former apple orchard. It consists of 40 acres of Pinot Noir and 10 acres of Chardonnay. Part of the Green Valley sub appellation of the Russian River Valley (officially now named “Green Valley of Russian River Valley”), Keefer Ranch is planted on Goldridge Loam which drains well and is thus particularly valued for its suitability for growing Pinot Noir. The Green Valley is defined by the fog and is usually the first place where the fog comes in through the Petaluma Gap, and the last place where the fog burns off, making it the coolest and foggiest part of the Russian River Valley. Many years ago the area was considered too cool for ripening Pinot Noir, but pioneering winegrower Warren Dutton’s early plantings (Chardonnay first planted in 1967) here proved otherwise. Keefer Ranch is now farmed by Marcy Keefer and her son Craig Strehlow. The clones are a nice mixture of Dijon 114, 115, 777, Pommard 5, Mariafeld (23), Wädenswil (2A), Swan and Calera. 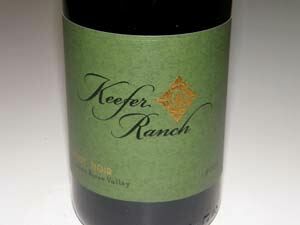 For many years, Keefer Ranch Vineyard has supplied grapes to notable Pinot Noir specialists including most recently, A.P. Vin, Failla, Freeman, Kosta Browne, Loring Wine Co., Pali, and Siduri. 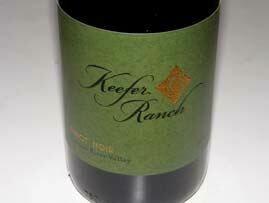 Beginning in 2006, Marcy Keefer and Craig Strehlow launched their own Keefer Ranch label. They source from estate blocks planted to Swan selection and Pommard 5 until 2008 when they added Dijon 115 to the blend. Craig is handling the winemaking duties, and the inaugural release is quite impressive. In 2010, phased replanting of the estate Chardonnay ended and 2 acres of Calera selection and 3 acres of Swan selection were planted. Some of the new Pinot Noir vines production will eventually go into the Keefer Ranch Estate Pinot Noir. 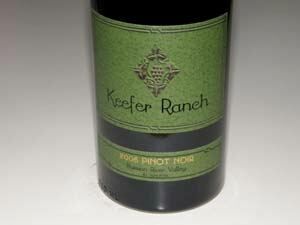 Keefer Ranch Pinot Noir is sold through a mailing list and on the website. 707-829-5950.